Dr. Scot Saltstone is quite the popular fishing partner among his friends and patients in Powassan, 30 km south of North Bay, Ont. But it's not his medical skills they're after. They want his prowess as a paddler. "Ever since I started marathon canoeing I've been someone they don't mind going out with," said Saltstone. "They know I can paddle like a madman and get them places in half the time it normally takes." Saltstone is a member of a small fraternity of marathon canoeists. Their idea of fun is to paddle 65 km in as short a time as possible, or just over 7 hours in Saltstone's case. Given that the average canoeist paddles about 4 kmph, this is an amazing - some might say crazy - feat. "I guess it goes along with the type-A personality," jokes Saltstone. "We want to get as much done as quickly as possible." He has demonstrated this trait at work as well as play. He entered medicine after a successful career in law, which included teaching stints in Northern Ontario. He graduated from McMaster medical school at the ripe young age of 35. "That's it, no more career changes," he says. "I've got a wife, 2 kids and a canoe. What more does anyone need?" Combining his enthusiasm for getting "lots done quickly" with his love of canoeing led - naturally enough - to the sport of marathon paddling. Each year he and his partner, who happens to be the local pharmacist, join hundreds of other paddlers for the annual Mattawa River Canoe Race. The route runs from North Bay to the Ottawa River via the historic Mattawa River, once vitally important to the voyageurs and the fur trade. But Saltstone isn't out to enjoy the scenery. The 65-km route takes recreational paddlers about 3 days to complete, but in 1998 the Saltstone team did it in 7 hours and 8 minutes. "I really do enjoy it, although I'll admit that halfway through the course I start to wonder how much fun I'm really having," he says. His team placed second in their class, losing to a couple of paddlers in their 60s. "That's the great thing about marathon canoeing, you just keep getting better," says Saltstone. "I find this is great for some of my older patients. I tell them, if you can remain half as healthy as those 2 guys who beat us, then you are doing great." Setting up a practice in the North Bay area was an easy decision for Saltstone, who grew up in that city. In addition to his solo family practice in Powassan, he does some emergency shifts in North Bay. Like most rural practices, the workload is heavy, varied at times, and challenging, but he always finds time to paddle. It's always been part of his life. Growing up in the middle of a canoeists' paradise that's better known as the Canadian Shield, Saltstone learned to paddle at an early age. 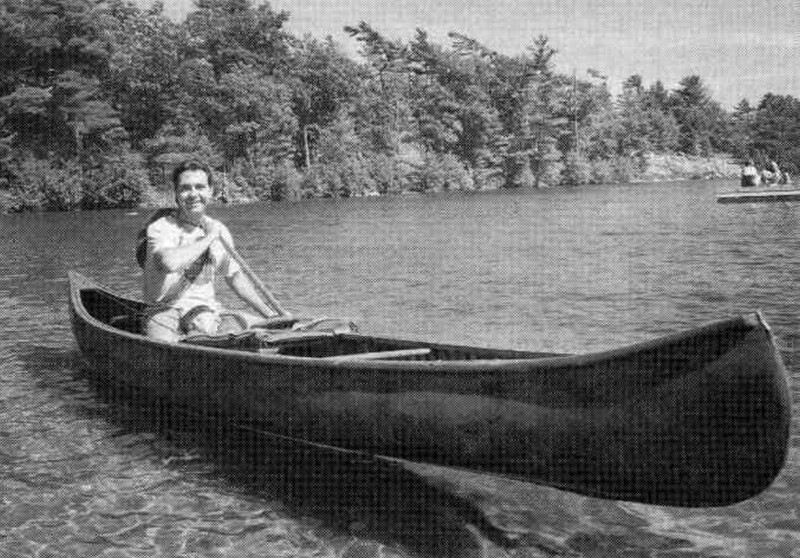 Youthful summers were spent plying Algonquin Provincial Park's waterways and learning proper canoeing techniques; eventually he started teaching the sport to others. But the first thing he did when he starting to enter marathon canoe races was to unlearn all he knew. "Just like all canoeists, I was raised on the J-stoke - it had to be beaten into me to stop doing this and use the sit-and-switch method." This is the technique racers use to maintain the fastest possible speed. The 2 canoeists sit in their seats and make 4 to 6 quick stokes on 1 side. At this point the paddler in the back bellows "HUT!" and both switch sides simultaneously to repeat the strokes. With this technique, Saltstone and his partner maintain about 45 strokes per minute for more than 7 hours. For fun, Saltstone is planning a trip from the southern tip of Algonquin Park to the northern edge. He figures that the route should take him and his partner "a day or two." Typical paddlers would take a week or more. Figure 1. Saltstone: What's a bit of pain?